National Geographic Traveler threw its 25th annual photo contest, and received more than 15,500 entries from all over the world. They narrowed those down to a premiere 11. Photographers included some brief and nondescript captions to accentuate their travel snaps, but we're offering our own travel snap tips so you, too, can fill your feed with "travel p*rn". 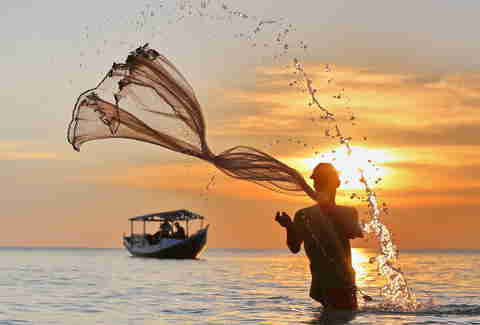 Taken in South Sulawesi, Indonesia, this shot grabs the viewers attention because the fisherman's rendered faceless by the angle of the sun... meaning the subject represents the large, faceless fishing community of Indo. Also, his cast net form is spot on. Tip to take away: Get close to your subject, and capture them doing something active to bring life to your shot. 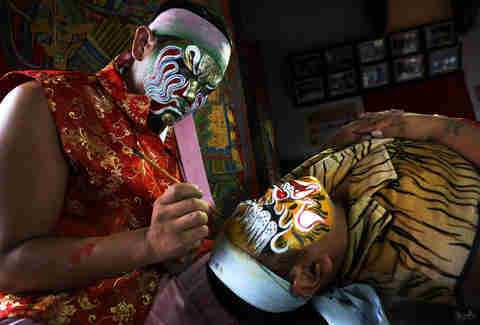 Often seen at traditional religious gatherings in Taichung, Taiwan, the Guanjiang Shou paint their faces with fierce designs and perform choreographed dances. They're often referred to as the "underworld police", which makes sense, because anyone with a tiger-striped blazer and terrifying face paint is probably in a position of authority. We think the snapper's unfettered access to these dudes makes it 'gramable. Tip to take away: Visually-interesting subjects will make for awesome photos, regardless of how expensive your camera and lenses are. This shot from Queenstown, New Zealand, raises some eyebrows. 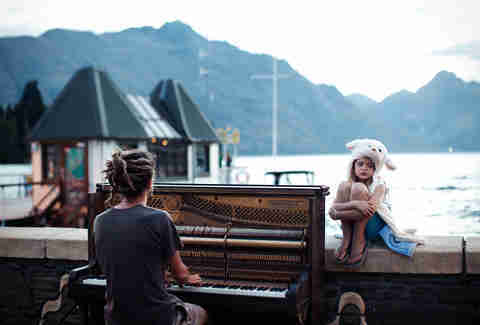 Why is that piano outside by the lake? How did it get there? Who is that girl? How can anyone be that bummed wearing a cartoonish sheep hat? Is she being super-meta, as there are more sheep than Kiwis in NZ? White people still have dreadlocks?! We love this photo though -- check out that juxtaposition of the blurred countryside with the dreads... it's like, that which is blurred in nature, is also in focus, you know? You ever look at the back of a $20 bill.... like, really look?! Tip to take away: Capture the unexpected if you want a shot that inspires a second look. Smiling selfies ain't on this list. 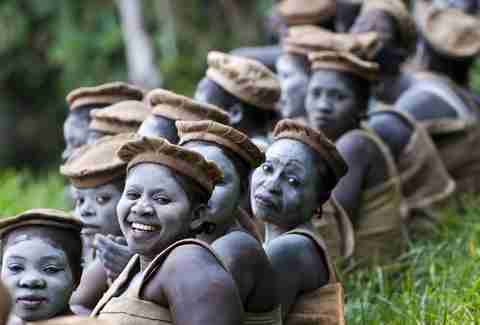 Taken in the Democratic Republic of the Congo, this photo was shot just before these ladies were about to participate in a private religious ceremony. Expressing the human experience in their faces, emotions flare as the two main subjects present either a :-) or a :-( offering a take on the emotional spectrum in the digital age. Tip to take away: Contrasts in subjects, surrounds, and colors make the grade. 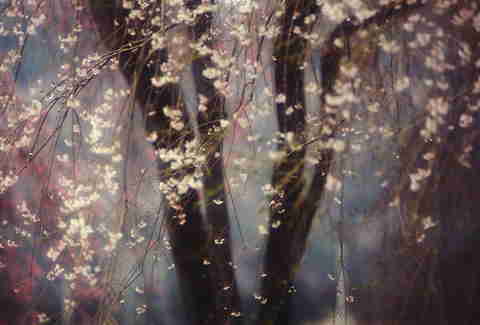 This is a picture of a cherry blossom from the Seiunji Temple in Saitama, Japan. It is neither offensive nor representational of a larger global discussion. It is, in fact, just a pleasant picture of a cherry blossom, and that's ok. Everything is going to be ok. Has Jewel seen this? It'd make a pretty cool album cover. Note to self -- occasional inoffensive flora in your Instagram feed is super ok, travelers. 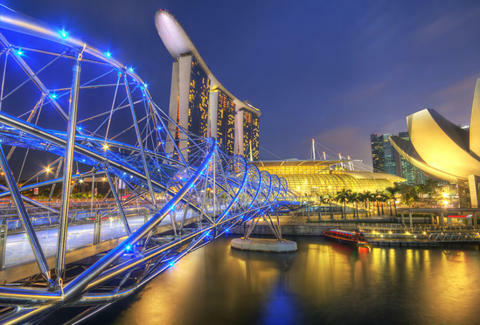 Tip to take away: Bring a tripod, brother; your withdrawl shakes won't let you capture crystal-clear details. Not actually the child of a reindeer (which would be pretty awesome, albeit against all laws of nature), this young lad is the son of reindeer herders in Magerøya, Norway. By the time they can crawl, these kids are schooled in handling the animals and rough terrain in which they live. Why is this picture so great? 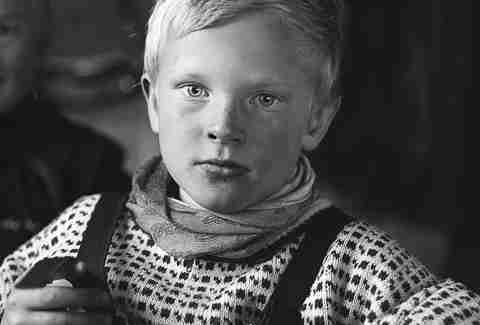 Because this kid is a goddamn reindeer herder, and that's f**king awesome. Also? The black and white filter's sometimes a good idea on your vacay pics. Tip to take away: When shooting black and white, do it in RAW and with the lowest ISO possible. 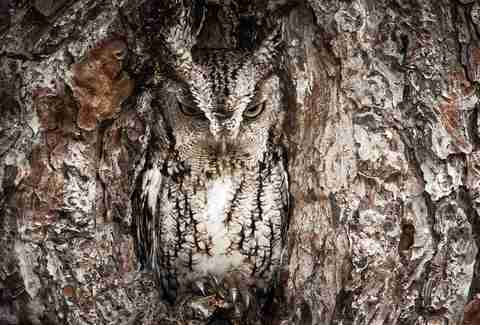 This tree owl from the Okefenokee Swamp in Georgia is about the weirdest thing ever, save for that one guy who answered your question with "oke-fenokee!". The camo'd-out mouse murderer is a great example of how we often try to blend in to our surroundings, only to be eventually uncovered and exploited for our cool talon-hands and devilishly handsome looks, which is ALWAYS happening in the Okefenokee Swamp. Traveler's note? Fauna works even better than flora. Tip to take away: Use both eyes when shooting animals -- one on your viewfinder, and one on your mark. Hailing from Bagan, Myanmar (Burma), this "lady in water" seems to not understand how water works. Someone should tell her to stop watering the water, it's wet enough! Oh well, to each their own. What's really neat about this photo is how tranquil the water surrounding the woman is. In her immediate vicinity, there's chaos, but just outside of that, the serene. 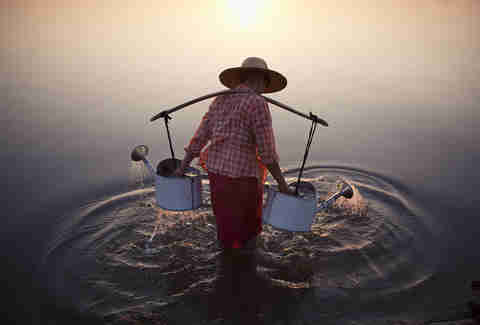 It's much like the universe, if the universe were a lady in Bagan who waters the water, and that's deep. Tip to take away: Early morning and late afternoon are both referred to as the "golden hour", since they result in awesome natural lighting. Rise and shine, and shoot through happy hour. Say cheese? SAY CHEESE?! NO. 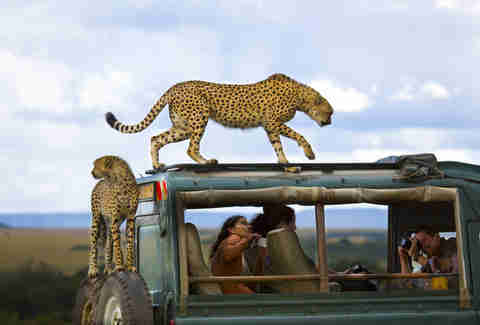 Say "Excuse me, tour sir, I do believe the windows are down and there's a pair of giant, hungry cats crawling on our vehicle. Do you mind rectifying the situation?" And then, do what the woman in the backseat is doing, and snap the most badass selfie of all time. If snapping selfies and chillin' with cheetahs seem like your thing, head over to Kenya and visit the Masai Mara National Park. Tip to take away: Just put an African safari on your bucket list already -- your pictures will be amazing no matter what you do. Guess where this was taken? Utah. Yeah, cool things actually do happen there, and when they do, they receive 2nd place in super-admirable travel photo contests. 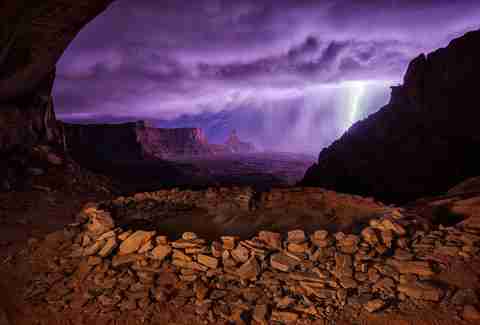 The photographer behind this was on a hike in Canyonlands National Park, looking for a primo spot to snap some shots of the Milky Way. However, when a huge thunderstorm rolled though, he was able to get this instead. Look at how bright! Can you imagine what ancestral tribes would've thought when they saw something like this? Never mind -- can you image what would've happened in Weird Science with a lightning strike like that? Babezilla. That's what. Tip to take away: Lock your focus on "infinity" when photographing lightning, or else your shots'll be blurry as all get-out. Out of 15,500 entries, this photo was chosen as the best travel photo of 2013. 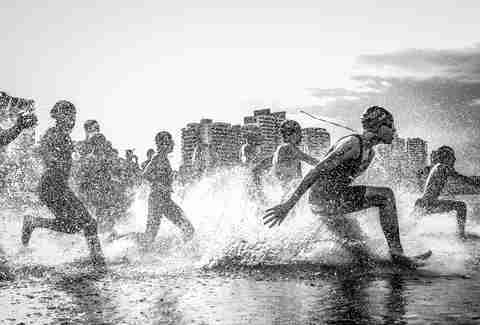 It was shot in Manaus, Brazil, during an aquathon championship race where tons of folks were just beginning their challenge, and running into the ocean. The shot exudes elevated levels of energy and determination, while simultaneously reminding the viewer to keep our actions fluid throughout life -- aquathons are mad tough, and swimming is a great way to relax. Also? Action 'grams reign supreme when snapping away as you explore this big, bad world of ours. Tip to take away: A fast shutter speed will result in a crisp image, but you can use a slow shutter speed when capturing sports if you'd prefer a blurred background.